Apple's new MacBook is certainly slim - as might be the chances of you buying one. As well as revealing more details regarding its forthcoming Watch, Apple refreshed its laptop line yesterday, with the most eye-catching announcement being that of a completely new MacBook - one with no Air or Pro suffix attached to its name. Weighing just two pounds and a mere 13.1mm thick (or 13.1mm 'thin', if you want to quote Apple), this still manages to pack in a full-size keyboard, 12-inch Retina display and the new Force Touch trackpad, which offers built-in pressure sensors. You can even choose your colour: gold, silver, or space grey. It's slim, lightweight and undeniably elegant, then, but what should steer musicians away from the new MacBook are its paucity of connectivity options and relative lack of CPU power. Other than the headphones socket, all you get is one USB-C port, which is designed to handle charging, USB 3.1 data connectivity and hook-up to an external display. It doesn't take a member of Apple's Genius Bar team to work out that three into one doesn't go, though; you can buy a £65/$79 adapter that splits the connector into power, display and USB ports (which, theoretically, you could then plug a USB hub into) but this is hardly the most elegant solution. Musicians should quickly come to the conclusion that Apple has better options elsewhere in its range. For musicians who use multiple USB peripherals (that'll be most of us) this port issue alone should be a dealbreaker, but there's also the fact that the MacBook contains a Core M processor, which has less grunt than the Core i chips that are found in all of Apple's other laptops. Oh, and there's no Thunderbolt port, either. So, while the new MacBook might well appeal to those who want an undeniably slick, super-portable laptop for 'general' use, power- and port-hungry musicians should quickly come to the conclusion that Apple has better options elsewhere in its range. Speaking of which, both the MacBook Air and 13-inch MacBook Pro with Retina Display have been updated. The 11-inch and 13-inch MacBook Airs now have faster processors, improved graphics and support for Thunderbolt 2, while the 13-inch model also has faster flash storage. The 13-inch MacBook Pro with Retina display also gets a faster processor, better graphics and faster flash storage, while battery life is said to have been improved, too. The aforementioned Force Touch trackpad is included here as well. 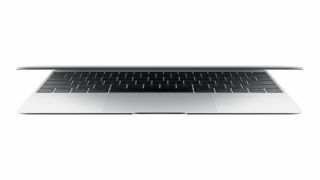 You can compare all of the MacBooks' specs on the Apple website. Prices start at £1,049/$1,299 for the new MacBook, £749/$899 for the 11-inch MacBook Air, £849/$999 for the 13-inch MacBook Air, and £999/$1,299 for the 13-inch MacBook Pro with Retina display. The standard 13-inch MacBook Pro is also still available for £899/$1,099, while prices for the 15-inch MacBook Pro with Retina display, which keeps the same specs as before, start at £1,599/$1,999.